Candy Cane Marshmallows are an easy Christmas candy that anyone can make! 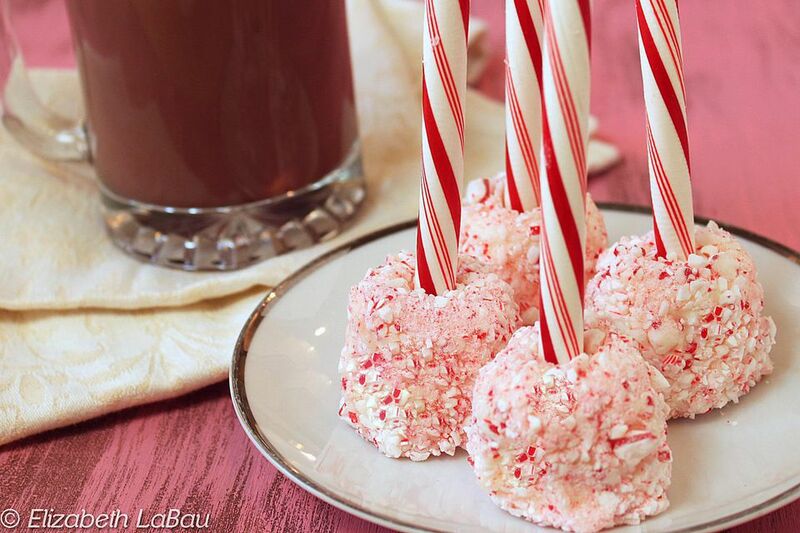 Just take marshmallows, skewer them with peppermint sticks, and then roll them in white chocolate and crushed candy canes. Dunk them in hot chocolate or coffee for a fun seasonal treat, or give them as a holiday gift! If you want to make your Candy Cane Marshmallows a little more gourmet, consider making your own marshmallows or your own candy canes! Take 12 of the candy canes and break them where they begin to bend, so that you are left with 12 straight peppermint sticks and 12 U-shaped candy bits. Set aside the straight sticks for now, and place the U-shapes and the remaining 8 unwrapped candy canes in a food processor. Pulse on/off several times for 5-10 seconds each, until the canes have been crushed into small pieces but are not yet dust. Alternately, place the candy canes in a large Ziploc bag and seal tightly. Use a rolling pin to roll/smash the candy canes until they are the size you desire. Place the white chocolate into a microwave-safe bowl and melt it in the microwave in 30-second increments, stirring after every 30 seconds to prevent overheating. Take a marshmallow and skewer it with a peppermint stick so that it is securely stuck to the end of the stick. Repeat until all 12 of your marshmallows are skewered. Holding the candy by the peppermint stick, dip the marshmallow completely in the white chocolate. Take it out of the chocolate and let the excess white chocolate drip back into the bowl. While the white chocolate is still wet, roll the marshmallow in crushed candy canes so that it's completely covered. Set it marshmallow-side down on a baking sheet covered in foil or waxed paper to harden. Repeat until all of the marshmallows have been dipped and rolled in candy canes. Let the Peppermint Stick Marshmallows set at room temperature or in the refrigerator. They can be stored in an airtight container for up to two weeks, but depending on your humidity, the candy canes may start to get sticky within a few days.